The International Winter Course ‘Human Rights and Asia’ is designed to allow participants to think about the universality of human rights in particular contexts of Asia and to gain a deepened understanding about human rights issues in this region. This two-week intensive course, taught by experts who have extensive experience of working in the fields of human rights, was launched in 2014 and now is waiting for its fourth year’s participants. It offers both general sessions on international human rights norms and human rights protection mechanisms, and thematic sessions on contemporary issues and case studies in Asia. 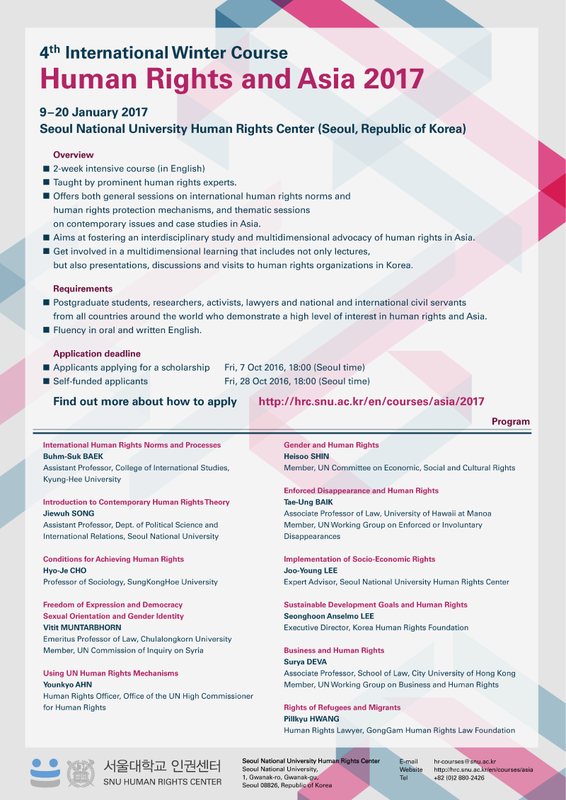 The 4th International Winer Course ‘Human Rights and Asia 2017’ will provide a unique opportunity to discuss human rights and various contemporary themes such as freedom of expression and democracy, gender/sexuality, enforced disappearance, socio-economic rights, sustainable development, refugees and migrants, and business in the context of Asia. Participants will be involved in a multidimensional learning that includes not only lectures, but also presentations, discussions and visits to human rights organizations in Korea. Our course ultimately aims at fostering an interdisciplinary study and multidimensional advocacy of human rights in Asia. Information on courses of previous years (videos added) can be found on http://hrc.snu.ac.kr/en/courses/asia. This course is designed for postgraduate students, researchers, activists, lawyers and national and international civil servants from all countries around the world who demonstrate a high level of interest in human rights and Asia. The course is taught in English. Fluency in oral and written is therefore required. The number of participants is limited to 40 and participants will be selected in a way to ensure the diversity within participants in terms of professional and academic background, region and field of interests. C. Download the Application Documents which contain the following forms in its annexes, complete them and save it under the file name: "Your SURNAME & Name – Application 2017.docx"
D. Save your CV under the file name: "Your SURNAME & Name – CV 2017"
i. To be sent to hr-courses@snu.ac.kr directly by your referee (your university supervisor or your employer/colleague). ii. Both the attached file name of the letter of recommendation and the subject line of the e-mail should be: “Your SURNAME & Name – Recommendation 2017”. Please make sure that the recommendation letter also meets the deadline below. The course fee covers tuition, course materials, refreshments, daily lunch during the course including a welcome lunch (first day) as well as a farewell reception (last day). It does NOT cover accommodation (see below), breakfast, dinner or meals during the weekend. The above student dormitory on campus is available for all participants (optional). Two participants will share a twin room. If you wish to use this on-campus accommodation, please indicate so on the Online Application Form. A limited number of scholarships are available for participants with financial difficulties to pay for the course. Applicants who have financial difficulties may apply for a full or partial scholarship provided by us. The scholarship may include the course fee, the accommodation fee at the student dormitory on campus and visa fee, where relevant. Airfare will be reimbursed upon presentation of relevant receipts up to a ceiling amount. The scholarship does NOT cover other travel or daily living expenses during the course. Please also note that the number of full scholarships is very limited due to our tight budget. If you wish to apply for a scholarship, please indicate so on the Online Application Form and also complete the Scholarship Application Form contained in the Application Documents. After a careful review of the applications, successful applicants will receive a letter of admission and fee payment guidelines. Selected participants will be expected to pay the course fee and the accommodation fee (if applicable). All overseas participants are also required to send us a scanned copy of their passports. Younkyo AHN is a Human Rights Officer at the United Nations. She joined OHCHR (Office of the UN High Commissioner for Human Rights) in 2003 and supported various UN human rights mechanisms, including the Special Procedures of the Human Rights Council and the Human Rights Treaty Bodies (CCPR, CAT, CERD, CRC, CEDAW, CED and petitions). She also acted as focal point for liaison with NGOs, human rights training and the Asia-Pacific region in the team. Prior to that, she worked for other IOs as consultant, trainee and intern (ILO, UNCTAD and International Court of Justice), national and international NGOs in the fields of human rights/development, as well as embassy. She received a DEA in international law from HEI, Geneva. Buhm-Suk BAEK is Assistant Professor at Kyung-Hee University, College of International Studies in Korea. He received a LL.B. from Seoul National University, and LL.M. and J.S.D. in public international law from Cornell Law School. Previously, he was a Research Fellow at Asan Institute for Policy Studies of Korea in 2012- 2013 as well as a Visiting Research Fellow at Georgetown University Law Center in the 2011 - 2012 academic years. His research focuses on international human rights law, transitional justice, law and development and third world approaches to international law. His recent publications include “NHRIs, RHRIs, and Human Rights NGOs,” Florida Journal of International Law, “The Medium Foreseeing the Future,” Socio-Legal Review, and “Mere Ritual or Gradual Change,” Northwestern Interdisciplinary Law Review. He also published Transitional Justice in post-unification Korea, Palgrave McMillan, with Ruti Teitel in Oct. 2015. Tae-Ung BAIK is an Associate Professor of Law at the William S. Richardson School of Law, University of Hawaii at Manoa and currently a member of the UN Human Rights Council’s Working Group on Enforced or Involuntary Disappearances. Professor Baik teaches international human rights law, international criminal law, and Korean law. After graduating from Seoul National University College of Law, he earned his Master’s (LL.M.) and Doctorate (JSD) degrees in International Human Rights Law from Notre Dame Law School in the U.S. He was admitted to the New York State Bar, and worked for Human Rights Watch in New York as a research intern and later as a research consultant, focusing on human rights issues in North and South Korea. He conducted research on human rights issues as a visiting scholar at Harvard Law School in 2002. He also served the South Korean Delegation to the 56th United Nations Sub-Commission on the Promotion and Protection of Human Rights as a legal advisor. Cambridge University Press published his book, Emerging Regional Human Rights Systems in Asia, in 2012. Hyo-Je CHO is Professor of sociology at SungKongHoe University, Seoul. He has written extensively on the subjects of human rights and civil society. Among his monographs and co-edited works are Horizons of Human Rights (in Korean: Humanitas, 2016), Human Rights Odyssey (in Korean; Gyoyangin, 2015), Contemporary South Korean Society (Routledge, 2013), In Search of Human Rights (in Korean; Hanul, 2011), A Grammar of Human Rights (in Korean; Humanitas, 2007), and Human Rights and Civic Activism in Korea (A-Media, 2005). He was closely involved with the establishment of the National Human Rights Commission of Korea, served in the Policy Panel for the Ministry of Justice and the Human Rights Committee of Seoul Metropolitan City. He has held visiting professorship in Harvard Law School, Free University Berlin and University of Costa Rica. He holds a BSc in politics and international relations from London University, an MSc in comparative social studies from Oxford University, and a PhD in social policy from London School of Economics and Political Science (LSE). Surya DEVA is an Associate Professor at the School of Law of City University of Hong Kong, and a Member of the UN Working Group on Business and Human Rights. His primary research interests lie in Business and Human Rights, Corporate Social Responsibility, India-China Constitutional Law and Sustainable Development. He has published extensively in these areas, and has advised the UN bodies, states, multinational corporations and civil society organisations on matters related to ‘business and human rights’. His books include Human Rights Obligations of Business: Beyond the Corporate Responsibility to Respect? (co-editor with David Bilchitz) (CUP, 2013); Confronting Capital Punishment in Asia: Human Rights, Politics, Public Opinion and Practices (co-editor with Roger Hood) (Oxford University Press, 2013); and Regulating Corporate Human Rights Violations: Humanizing Business (Routledge, 2012). Prof. Deva has also prepared reports for the International Commission of Jurists (ICJ) and the Ethical Trading Initiative (ETI). He is one of the founding Editors-in-Chief of the Business and Human Rights Journal (CUP), and sits on the Editorial/Advisory Board of the Netherlands Quarterly of Human Rights, and the Vienna Journal on International Constitutional Law. In 2014, he was elected a Member of the Executive Committee of the International Association of Constitutional Law. In Sup HAN is Director of Human Rights Center and professor of law at Seoul National University where he teaches criminal law, criminology and human rights. In Korean, he published many books such as Human Rights Lawyering under the Authoritarian Regime (2011); Advocating Independence under the Colonial Court (2012), Conscientious Objection and the Argument for Alternative Services (2014), Jury Trial and Citizen Participation (2005) and Kwangju and Beyond: Coping with State Atrocities in South Korea. Prof. Han has been deeply involved in judicial reform projects as the member of Judicial Reform Commission (2004), Korean Sentencing Committee (2007-2009), the Legal Education Committee for Law School (2007-2009) and the Judicial Ethics Committee at the Supreme Court (2011-2015). Pillkyu HWANG is a human rights lawyer at GongGam Human Rights Law Foundation and a lecturer at School of Law, Seoul National University. The main areas of his research and advocacy work include international human rights, migration, refugees, business and human rights, international adoptees, alternative child care, North Korean escapees, disaster and human rights, etc. both in Korea and Asia. He has been the Human Rights Committee coordinator of the Korean Bar Association (KBA) for 8 years. He graduated from SNU with an LL.B. and has earned his PhD in public international law at the same university. He was a visiting academic at the Centre on Migration, Policy and Society (COMPAS) of Oxford University in 2007, and a visiting fellow at the Human Rights Program of Harvard Law School in 2011-2012. For the last few years, he has played a leading role, as the chair, in two major regional human rights networks in Asia, the Asia Pacific Refugee Rights Network (APRRN) and the Asian Consortium for Human Rights Based Access to Justice (Hrba2j-Asia). Joo-Young LEE is an Expert Advisor to the Human Rights Center at Seoul National University and she is in charge of the Human Rights Research Division. She received her Ph.D in international human rights law at the University of Essex, MA in Human Rights at the University of Sussex in the UK, and BA in Social Policy at Seoul National University in South Korea. Her publications include ‘The Development of the International Covenant on Economic, Social and Cultural Rights and Its National Implications’, Korean Journal of International Law (2016: in Korean), A Human Rights Framework for Intellectual Property, Innovation and Access to Medicines (Ashgate, 2015), ‘Study on Hate Speech from an International Human Rights Law Perspective with Focus on Incitement to Hatred’ Korean Journal of International Law (2015: in Korean) , ‘Implementation of Economic, Social and Cultural Rights’, (co-authored with P Hunt et al. ), in N Rodley et al. (eds.) Routledge Handbook of International Human Rights Law (2013), ‘The Human Rights Responsibilities of Pharmaceutical Companies in relation to Access to Medicines’, (co-authored with P Hunt), The Journal of Law, Medicines and Ethics (2012). Seonghoon Anselmo LEE is Executive Director of the Korea Human Rights Foundation (KHRF) engaged in human rights issues related to corporate accountability, local government/city and development cooperation/Official Development Assistance (ODA) as well as human rights education. He is also Secretary General of the Asia Democracy Network (ADN) as well as co-convener of Asia Development Alliance (ADA). He has been teaching about global governance, civil society, human rights and development at the Graduate School of NGOs Studies at Kyung Hee University and others. Previously, he worked for the National Human Rights Commission of Korea (NHRCK) as Director General in charge of policy and education (April 2008-March 2010). He also served as Executive Director of Asian Forum for Human Rights and Development (FORUM-ASIA), a Bangkok-based regional human rights NGO (2005-April 2008) after working in Geneva for 8 years (1997-2004) as Secretary General of International Catholic Movement for Intellectual and Cultural Affairs (ICMICA)-Pax Romana, global network of Catholic professionals and intellectuals committed to social justice and peace. Vitit MUNTARBHORN is Emeritus Professor of Law at Chulalongkorn University, Bangkok and Independent Expert on the Protection against Violence and Discrimination based on Sexual Orientation and Gender Identity (SOGI). He is a graduate of the University of Oxford and the Free University of Brussels. He has helped the United Nations in a variety of capacities, including as UN Special Rapporteur on the Sale of Children and UN Special Rapporteur on the human rights situation in the Democratic People’s Republic of Korea (North Korea). In 2011, he was Chairperson of the UN Commission of Inquiry on the Ivory Coast. In 2012 he was appointed as one of the Commissioners of the UN Commission of Inquiry on Syria. He also serves as a member of the Committee of Experts on Conventions and Recommendations (International Labour Organization). He has published widely on international law, human rights and humanitarian law. Jiewuh SONG is an Assistant Professor in the Department of Political Science and International Relations at Seoul National University. She received a J.D. from Harvard Law School, a Ph.D. in philosophy from Harvard University, and a B.A. in sociology from Seoul National University. Before returning to SNU to teach, Song held postdoctoral positions at the Goethe University Frankfurt’s Justitia Amplificata Center and the MacMillan Center for International and Area Studies at Yale University. Prior to that, she worked for two years as a Clinical Supervisor at the Harvard Law School’s International Human Rights Clinic, leading a project on the human rights and environmental impacts of transnational corporate energy development in Myanmar. Song works on issues at the intersection of law, philosophy, and politics, and has particular interests in questions about international human rights law and institutions. Heisoo SHIN currently serves as a member of the UN Committee on Economic, Social and Cultural Rights. She holds a B.A. in English Language and Literature, a M.A. in Sociology from Ewha Womans University, and a Ph.D. from Rutgers University. She has been a lifelong advocate of the women’s human rights movement and has substantially contributed to the struggle to end violence against women. She served as an expert on the UN Committee on the Elimination of Discrimination against Women from 2001 to 2008, and as a commissioner of the National Human Rights Commission of Korea from 2005 to 2008. She is currently the representative of the Korea Center for United Nations Human Rights Policy (KOCUN), as well as a visiting professor at the Graduate School of International Studies at Ewha Womans University in Seoul. Since Nov. 2014, she has been coordinating 14 civil society organizations in 8 countries in Asia and the Netherlands to inscribe the documents on the military sexual slavery by Japan (the so-called “comfort women” system) as UNESCO’s documentary heritage.